Snapchat's valuation has soared from about $2 billion last year, when it reportedly declined an acquisition offer from Facebook, to $10 billion in its latest round of funding. Let's compare Snapchat's valuation and engagement metrics to those of other social networks/apps and attempt to understand the rationale behind this valuation. While Snapchat is still a pre-revenue company, they are preparing to roll out their first monetization attempt this November. The service, called Snapchat Discovery, will allow users to view publications or video clips from advertisers. At this point, Snapchat may successfully monetize their user base before Whatsapp does. Of course, there are various monetization models available to both, that have already been validated by Asian messaging apps. 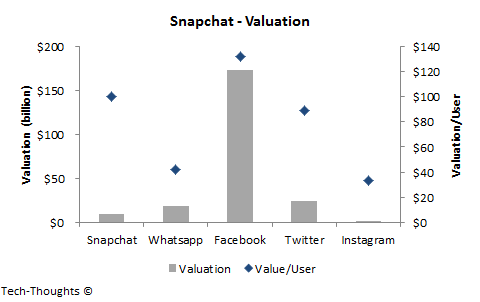 The chart at the top of this post compares the valuation of Snapchat with other leading social networks and apps. Of course, this isn't necessarily an apples-to-apples comparison -- Snapchat's valuation is based on a primary issue (sale of newly issued preference shares), Instagram and Whatsapp were secondary market transactions (sale of existing common and preference shares), while Facebook and Twitter are publicly listed (and hence, carry a liquidity premium). However, it does give us a rough understanding of how investors value each user. 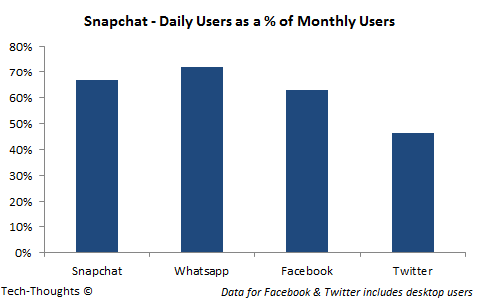 Snapchat's 100 million users are valued at $100 each, while a Whatsapp user was valued at ~$40. Snapchat's valuation multiple is very close to Twitter's ~$90 per user. We need to keep in mind that Twitter began advertising in 2010 and is on pace to generate more than $1 billion in revenue this year (ARPU of ~$4). In comparison, Asian messaging apps have much larger scale and have already hit annual ARPUs of ~$2 in a much shorter time frame (with a less valuable demographic). Given Snapchat's demographic advantages (users are primarily teenagers/young adults in Western markets); it has the potential to generate much higher ARPUs, with a user base that could potentially surpass Twitter's. Of course, this can only be accomplished if user engagement remains high. The chart above shows daily active users as a percentage of monthly active users on each platform. Again, this isn't an ideal measure of engagement, but it should give us a rough idea. Based on this, it appears that Snapchat and Whatsapp users are more engaged than those on any other platform. Given their user demographics, Whatsapp's eventual ARPU could potentially track those of Asian messaging apps. But Snapchat's valuation multiple suggests that it is expected to deliver much higher ARPUs from their smaller, but more valuable user base.